Navigation's Danny Conway challenges Mirfield Town's Dan Hoyle during the Heavy Woollen Sunday League clash. 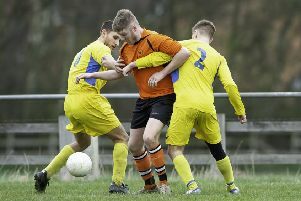 Mirfield Town picked up their first win in the Heavy Woollen Sunday League Premier Division after edging out Navigation 4-3. Kieran Corley hit a double for Mirfield, with Michael Rounding and Adam Brown completing the scoring, with Navigation replying through Jordan Webster, Alex Barnes and Lee Bennett. It was Navigation’s first defeat and they have now won one, drawn one and lost one of their opening three games. Deighton maintained their perfect start to their first season in the top flight, winning their third game in a row in a 5-3 victory at Wellington Westgate. Paul Pyke, Declan James, Tom Hague, Adam Hill and an own goal accounted for Deighton’s tally with Wellington replying through Lee Bradshaw (brace) and Dwayne Wilkinson. Walkers Hounds are second, two points behind the leaders, after Josh Lang (two), Danny Stocker, Ben Burnett, Ryan Wadsworth and Jonathan Lendon netted in a 6-4 win over AFC Chickenley, who had Shaun McDaid, Blake Dewhirst and Tim Clarke on the scoresheet. Linthwaite won 4-0 at bottom side Clifton Rangers. Snowdon are the new Championship leaders after they demolished St Ignatius 8-0 thanks to doubles from Irfan Ali and Arron Kennedy, plus strikes from James Heeley, Noman Hussain, Jamil Sair and Zia Ul-Haq. Previous leaders Mount Pleasant’s game with Clifton Rangers Reserves was postponed. Overthorpe Sports Club lie third after a 1-1 draw against Ravenswharfe. Steve Swift hit a delightful opener for Overthorpe but Stefan Madden’s 88th minute equaliser ensured the points were shared. Wire Works enjoyed a 6-0 win over Inter Batley thanks to a hat-trick from Jordan McCafferty-Smith, a brace from Niall St Hilaire plus one from Craig Smith. Birstall Cricket Club had Troy Bagshaw, Daniel McDaid, Jack McDermott, Bradley Richardson and Paul Lilley on target in a 5-2 win over Clifton Rangers Athletic, who replied through Martin Wagstaff and an own goal.